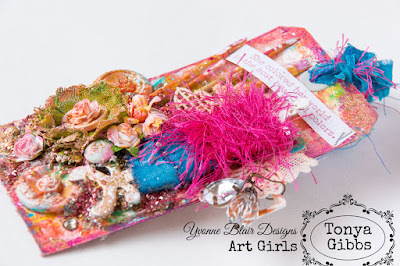 Hi everyone, today I have a colorful tag to share with you using Yvonne's Everyday Quotes 1 set that she created for Impression Obsession. 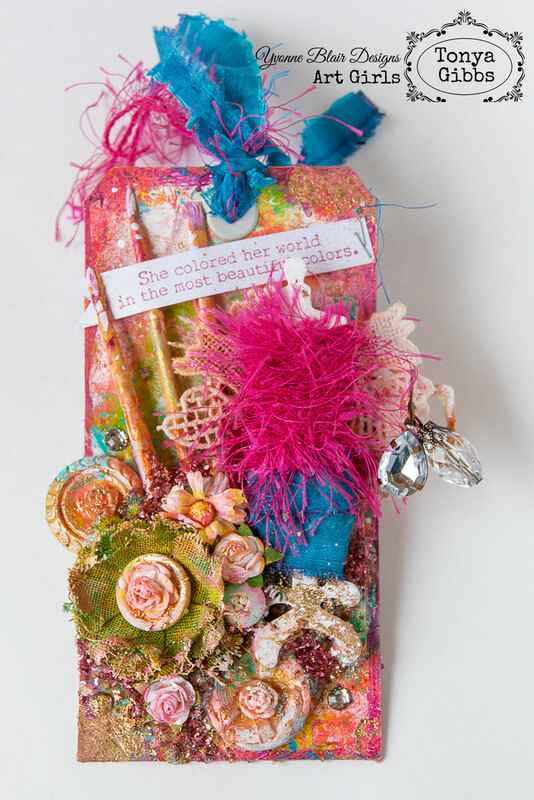 This set has so many wonderful phrases that are awesome to use in your mixed media projects. For today's tag, I wanted to create something vibrant and bright. 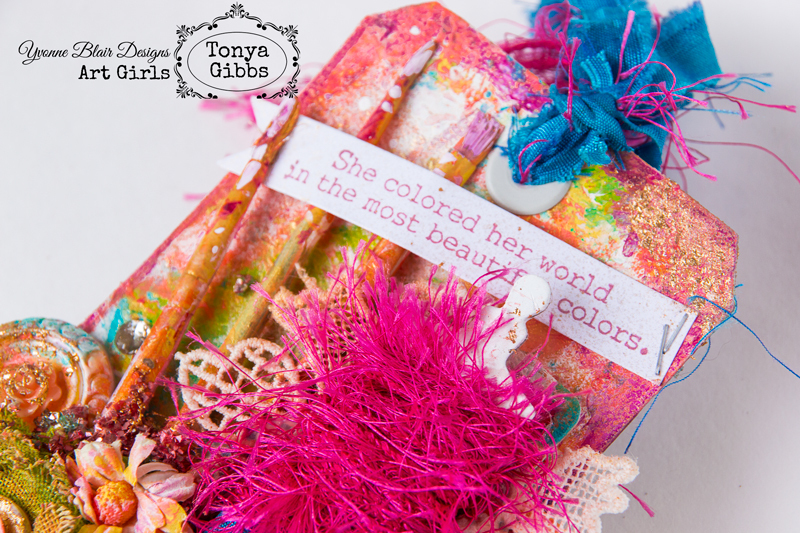 When I thought about the phrase "she colored her world in the most beautiful colors" I felt as though she was full of life, happy, fun, colorful, and I really wanted that to be reflected in my tag. I stuck with saturated colors, because these colors seem to bring joy to me. They remind me of a party, or celebration. I dressed my dressform in a feather styled dress as if she were going to out to dancing. 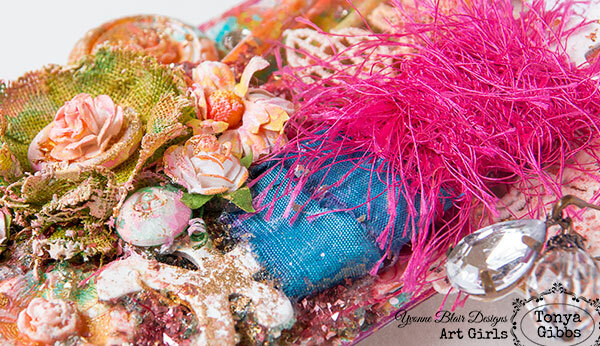 Look at all these wonderful layers of sparkle and color she is leaving in her trail. Wasn't that a lot of fun! I hope you were inspired to de-stash and make vibrant fun tag! I wanted lots of glitter, gold, and sparkle. When you hold this tag, I wanted you to think that there was a celebration happening. 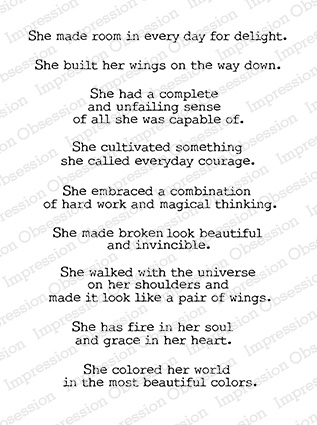 That "she was colorful, and really happy". Thanks, for stopping in today, I hope you enjoyed my process video, and tag share! Very fun! And I love that stamp set!